I was talking to my partner the other day and I was relaying a story about how I felt like I was failing at work. Project Management just seemed to be something I couldn’t get my head around. His response was to ask me how long it had been since I finished Undergrad. The answer (less than 10 years!) put everything in perspective. I’m still “green behind the ears” as far as my professional life. It’s funny because I know that refined skills like Project Management only come about from having failed. Failure is how we learn to fly (hence the Young Superman graphic above). It just feels different to have that reality thrown in my face. 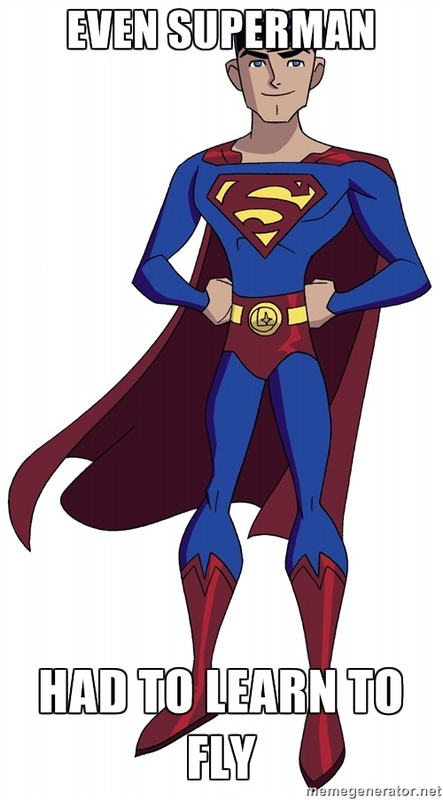 No one becomes a “Superhero” overnight…it takes time I suppose. So me and my partner recently got a puppy. I never realized how much work having one can be. There are days where the biting and the destruction really get me. Let’s not forget the tantrums that are very toddler-like. She once had a massive fit over me leaving the room. It was not pretty. Our adventures in Puppy Parenthood have been rocky to start and sometimes leave me very conflicted on if we made the the right decision to get her. Then I think of how fun she can be after a rough day at the office and then I’m good. She also takes to training like a sponge to water. I finally feel like a proper adult and it’s not too bad of a fit on me. Lately at work I’ve started taking on more project lead responsibilities. I thought I would be able to take the world by storm; however it hasn’t felt as natural as I thought. Call it my perfectionist personality at it’s worst but I feel like I’m failing at Project Management. It feels like I’m constantly running from fire-to-fire. My partner says welcome to the world of Project Management. Apparently managing the “fires” gets easier with experience and don’t sap as much energy. I’m anxiously awaiting that day lol. Anyways, what have you all been up to this summer?? Hey Guys! 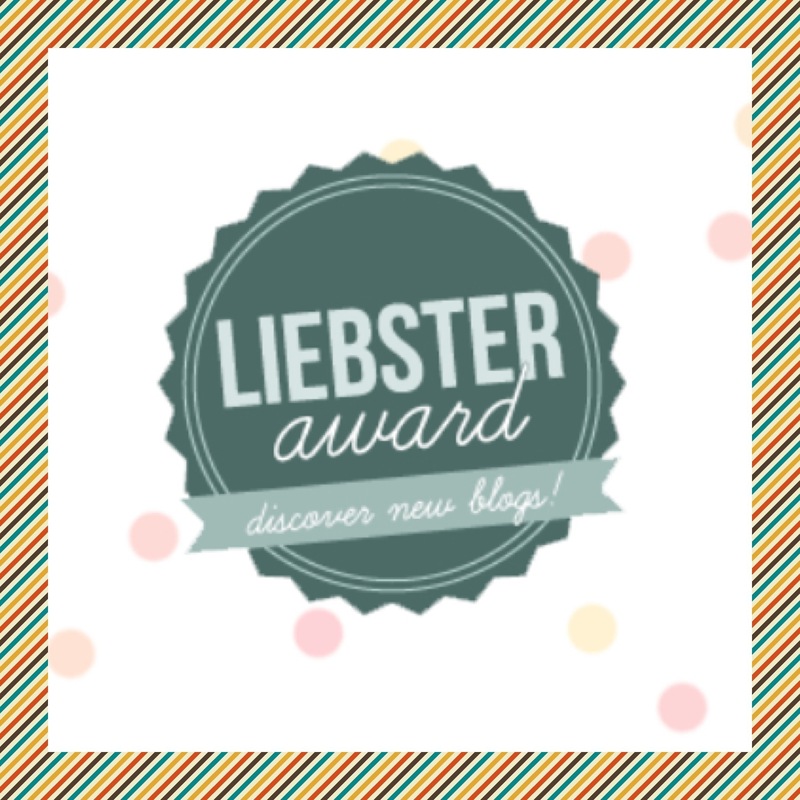 I’m pretty excited for my Liebster nomination from fellow blogger Confessions of An Irish Gay Guy! Thanks for the award! His blog is an awesome read and is super entertaining. One specific post It’s Going Down, I’m Yelling Tinder was so good that I just had to call it out (It also helps that I’m a fan of Ke$ha as well and got the reference lol)! Keep up the good work buddy! 2. Answer the 10 questions given to you by the nominee before you. 1. What age were you when you had your first kiss? My first kiss was during a truth or dare game that I was playing instead of actually participating in gym class. Here’s a shocker for y’all: It was a girl!!! 3. Which Simpsons character is most like you, and why? Most like Lisa. I’m a bookworm and I sometimes feel like I’m the most sane in my family (which is saying a lot because I think I’m straight-up crazy sometimes). 4. What disease would you cure if you had the power to cure one disease? This is going to sound totally cliche but I’d want to cure HIV. Even though most of the developed world has been able to move on from making HIV a killer, there are other places still fighting the battle. 5. Where in the world, other than where you are now would you most like to live? Spain! I have a trip scheduled there this year and I can’t wait! 6. What made you start your blog in the first place? I started my blog as a way to get over past scars. Now it has evolved into a place where I put a decent chunk of my thoughts for public consumption. 7. What’s more important in a man (or woman), looks or personality? Personality – If you can’t stand to be around them outside of the bedroom, then it’s a total no-go! 8. Which celebrity would most likely be your best friend, if you were famous? So this is politically driven but I just love Alex Wagner! 9. What food do you detest beyond belief and why? Raw Onion! It has a weird consistency coupled with a very strong taste and odor. I like it it in powder and cooked form but for some reason I can’t deal with Raw Onion. These blogs are all awesome reads and hopefully you’ll all swing by their blogs!! What’s the biggest problem facing the world right now? If you had to choose only one: cat or dog? Why? Would you choose a free trip or money? Do you believe in the idea of 5-year plans? Why or why not? How would you define success in life? If you could do what you love, and the ability to make good money doing it is certain, how much pain would you be willing to take on to make it happen? That’s it for now!!! Be on the look out for next post! So before I get started I want you all to know this comes from a place of love, not hate. I grew up around enough of you all to know that you’re not inherently evil (despite the best efforts of black culture to get me to think so), but I just want to give you some tough love for your own personal development. I want to start by asking you one key question: Do you realize how lucky you all are? It may not be readily obvious to you but society has been constructed in your favor. If you don’t believe me, just look at the list below. When you walk down the street, you never have to worry is anyone staring at you because they think you don’t belong in their space or that you’re there to wreak havoc. You never have to worry about people beating you within an inch of your life because of who you are. When you use marijuana at approximately the same rate that your black male equivalents use, you’re 4 times less likely to do time for it. With a felony conviction, you’re still more likely to get a job over your black male equivalents that have a clean record. I could list further examples but I think you all get the point. So given all of these things that you don’t have to worry about, it really concerns me when I see news articles where your demographic screams bloody murder about how society is discriminating against you all now. Well, hopefully I can provide an objective counterpoint for you. The initiatives that our country are trying to set forward, such as Anti-Discriminatory workplace laws, policies to combat poverty, and giving minority-owned businesses a leg-up, is not to punish you for your predecessors sins but its to get everyone on a level playing field. Discrimination is still very real and an hot issue today. You may not see it, but those of us that are minorities see it everyday. Instead of understanding this fact, a decent amount of you all come back with angry, racially insensitive retorts that only serves to perpetuate the narrative that you’re all a bunch of red-necked hilljacks. You’ve all had the top of the pyramid to yourselves for about 300+ years now. What about does a level playing field scares you all so much? As far as I can see, we’re all trying to move to an era where everyone can peacefully coexist. Plus you all still seem to have the advantage where it counts. So buck up and get over this case of being a “victim” because society isn’t trying to leave you behind; it’s just finally starting to give everyone an equal shot. Since most of you don’t know me personally, let me start by clarifying one thing: Growing up, I hated reading for pleasure. I read when I had to (school, work, etc.). 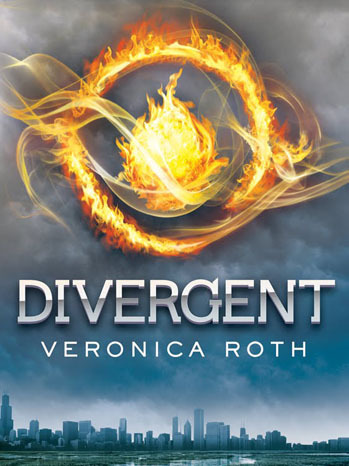 I recently got a good tip from a friend to check out this book series Divergent and for the first time, I was fully engaged in reading for pleasure! It’s pretty amazing how caught up one can get in a story. I even started to feel connected to the characters! It’s interesting how a good book can actually be fun to read. I managed to lose my entire winter break from school (about 5 weeks) to the Divergent series and it pointed me in the direction of another series called Matched (equally awesome!). Both series had a similar topic: Dystopian Societies. Dystopian Societies are the most amazing genre to read because it so closely reflects everything that is going on now but they’ve put a slight futuristic Sci-Fi spin on it. Overall, reading for pleasure gave me a couple of added benefits that I didn’t expect: It calmed my nerves after a rough day at work and it gave me another common interest with my friends. It’s funny because I didn’t realize I had a few friends who were also reading the same series! Why do you decide to torture us fellow commuters so much with your poor decision-making? After a few instances of dealing with a few of you who should have been in the right-lane during my evening commutes, I decided enough is enough and it’s time for you all to hear it! You should know that there is legislation on the books that actually require the Police to give you a fine if you are caught hogging the left lane by going right at the speed limit. See the article below for an example. I know it sounds counter to your own thought process of you’re driving the speed limit but the following line should sound familiar: “The left lane is for passing”. If this doesn’t sound familiar then maybe you should be taken back through Driving school. I’m a pretty reasonable person so I totally get when you all decide to drive slower in the right lane (which is what its meant for), or even driving the speed limit in the center lane (slightly annoying when you decide to drive under the limit in the center though) but when you decide to take this foolishness into the left lane, you generate traffic jams and endanger the rest of us. People who are actually keeping up with traffic have to come to a sudden stop because you have decided to mess with the flow of traffic. Does this seem fair, or even safe, to you? From one commuter to another, take my advice and brush up on lane courtesy. Lane courtesy dictates if you aren’t keeping up with traffic (no matter the speed), then move right so that those who are driving quicker than you don’t have to worry about navigating around you. Don’t be that person who is the source of the traffic jam because you’ve decided to enforce the speed limit on the highway by becoming an obstruction.